The human bones arrived in a cardboard box and the investigators scrutinized them one by one: About a dozen long bones, more than 25 vertebrae, pieces of a jawbone. Laid out on a long, rectangular table, the remains held a tale of human tragedy. The investigators – anthropologists working for Parks Canada – began to piece that tale together, helping bring some resolution to a mystery that straddles time and two continents. The bones have found an identity – at least, as close to one as they will ever get. The partial skeletons were discovered near the surface of a stony beach on Quebec’s Gaspé peninsula three years ago. Now, officials have determined they are those of three children from Europe who showed signs of malnutrition. They believe they were almost certainly Irish migrants who died in a 19th-century shipwreck in Canadian waters as they fled poverty in search of a better life. The findings are poignant for Georges Kavanagh, a resident of Gaspé who traces his ancestors to some of the victims and survivors of the shipwreck. He has been carefully following the story of the bones since they were found. He wants to ensure they get a proper reburial. The quest to trace the origins of the bones began in 2011. A passerby discovered the remains on the shoreline of Cap-des-Rosiers, within the boundaries of the Forillon National Park, 700 kilometres northeast of Quebec City. Erosion had exposed them to the elements and disturbed the resting place of three children who likely had little rest in their short lives. Officials believe the three were probably victims of the wreck of the Carricks, one of the many “coffin ships” that crossed the Atlantic carrying Irish migrants fleeing famine in their homeland. The Carricks was heading to Quebec City, but foundered in a violent storm off Cap-des-Rosiers in 1847. Reports of the death toll vary, but about 100 bodies washed ashore after the storm and were buried in a mass grave; survivors were taken in by local families. Montreal’s St. Patrick’s parish later erected a stone marker at the site commemorating the tragedy, which stands only 40 yards from where the children’s skeletal remains were found. Parks Canada sent the bones for analysis to Quebec’s forensics lab in Montreal, then they were taken to the University of Montreal, where anthropologist Isabelle Ribot and graduate student Rémi Toupin began to examine them in detective-like detail. The length of the bones and other clues indicated the victims were children – two aged between 7 and 9, the other 11 or 12. A curve in one bone pointed to malnutrition consistent with rickets, a condition caused by vitamin D deficiency. Mr. Toupin scraped off a bit of tooth enamel for a chemical analysis. The results point to a plant-based diet found in Europe that could have included potatoes, a staple in Ireland before the catastrophic blight caused a famine that killed swaths of the population and sent legions into exile. A clue found on the site offered a glimpse of the victims’ history: An unvarnished, nickel-sized, dark-brown wooden button. It was traced to 19th-century Europe. It would take carbon dating and DNA testing to be sure the victims were aboard the Carricks. Parks Canada, however, says it will not take the analysis any further. The Carricks was among hundreds of migrant ships bound for the port of Quebec City in 1847, the darkest year of the famine in Ireland. The voyage was perilous for the desperate travellers, who were often weakened by hunger and disease. Nearly 5,300 of those fleeing died on their way to Canada. The bones from Cap-des-Rosiers are to be repatriated to the Gaspé for reburial next year. Mr. Kavanagh would like to find the precise spot of the common grave and move it, if need be, to prevent other human remains from being disturbed by erosion. We are pleased to welcome you to Ireland’s Great Hunger Institute’s conference to be held at Quinnipiac University in Hamden, Connecticut in June. The conference will examine the role of women during a period of sustained hunger or famine. We are delighted to have three prominent and distinguished keynote speakers: Jason King, PhD, of Galway University; Ciarán Reilly, PhD, of Maynooth University; and Margaret Ward, PhD, of Queen’s University, Belfast. We look forward to hearing about their research on this largely disregarded topic. Details of the conference can be found below. Please check back regularly for updates to the program. Papers are welcome from both established and starting scholars – we hope that you will join us for this exciting and ground-breaking conference. The Irish Famine Summer School in Strokestown has been officially launched during the recent Roses of Tralee visit to the town. The summer school to be held in June 2015 follows the success of the International Famine Conference and the National Famine Commemoration held in May. 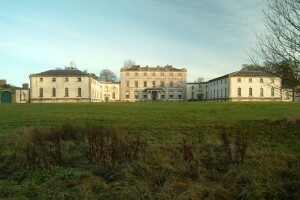 The summer school is a joint initiative between the Irish Famine Museum, Strokestown Community Development Association, Roscommon County Council and the Centre for the Study of Historic Irish Houses and Estates at NUI Maynooth. It will also be supported by Ireland’s Great Hunger Institute at Quinnipiac University and St Michael’s College, University of Toronto. A former student of the University, the Toronto Rose Katie Blundell officially launched the school this week with Roscommon Cathaoirleach John Cummins. The school will run next year from June 17th to June 21st and will include lectures, workshops, drama, music and excursions of the historic sites in Roscommon. 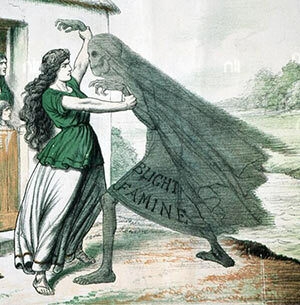 The Great Irish Famine (1845–52) was one of the most influential periods in the history of Ireland and its diaspora. While emigration had already been a common feature in Irish life before the 1840s, the Famine catalysed the process, causing far greater numbers to leave the island and changing the nature of Irish emigration and Irish communities overseas, while also greatly influencing Irish society at home. On 23–24 April 2015, Radboud University Nijmegen in collaboration with The Netherlands Organisation for Scientific Research (NWO) will host the first meeting of the International Network of Irish Famine Studies (INIFS). This network brings together scholars conducting groundbreaking, ongoing research on the Great Irish Famine. As such, it intends to stimulate the development of interdisciplinary dialogues and methodologies necessary to face future challenges of the field of Irish Famine Studies. Specifically, this inaugural meeting will have Famine migration and diaspora as its theme, focusing on not just the Irish-North-American diaspora, but also Irish migration across the globe, to Latin America and across the Pacific for example. Moreover, it will investigate both the immediate and long-term effects of Famine migration, and will view these processes of migration, settlement and the establishment of transnational overseas communities through an interdisciplinary and comparative lens.